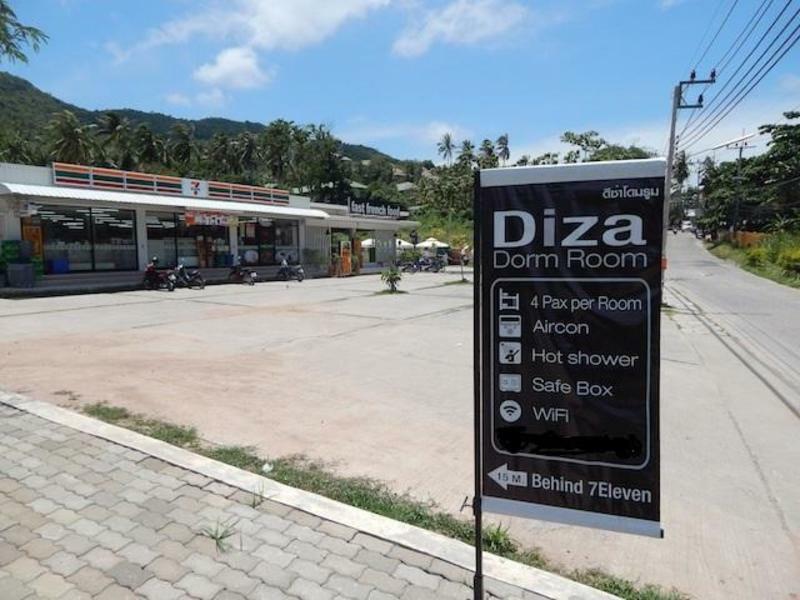 Diza Dorm Rooms is located in the center of Sairee beach at the new 7-11 plaza on the main road. It is across the street from Island resort. The hostel is in the new plaza about 1km from the pier on the right hand side very easy to find and easy to walk to. It will take about 10-15 minutes to walk from the pier on the main road. The property offers small cozy dorm rooms with only 4 beds per room. Each room has Aircon, hot shower, free wifi, and lockers for your security. There is a 24 hours reception staff on site to assist you. There are tables and chairs that are set up outside for hanging out and meeting other backpackers. The hostel has an easy going vibe and is only a minute walk to sairee beach and all the crazy night life on koh tao. A 7-11 and many restaurants are only a few steps around the hostel, very convenience for late night snacks. take a taxi from the pier to the new big 7-11 plaza in Sairee beach. Across from Island resort. or you could walk on the main road to Sariee beach about 10-15 minutes. we are on the right hand side on the main road.